Most histories of sexuality in the United States mark the 1969 “Stonewall Rebellion” as the central event in the struggle for LGBTQ rights, and it now has iconic status in our cultural imagination. Emerging from the robust analysis of gender and sexuality in the Department of Religion at Princeton, After the Wrath of God and Reforming Sodom also acknowledge the centrality of Stonewall, but they move beyond it in order to consider more carefully the religious voices, perspectives, and activists that have been left out of the story. 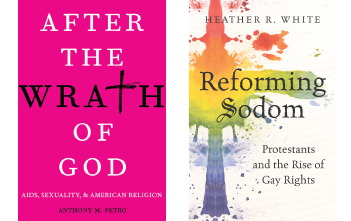 Both books show how Christian activists within various churches and religious organizations have had a larger, more progressive role in the fight for LGBTQ rights and in responses to the AIDS crisis than previously thought.